How does using My College Options benefit students and parents? My College Options provides students with the opportunity to create a personal online college and career planning profile. Students can match their individual needs, talents, abilities, goals, and interests with the offerings of over 5,500 accredited post-secondary institutions across the United States . Along with the college match, students have access to valuable information about paying for college, types of institutions, career exploration, how to apply for college, and much, much more. As a result of using this FREE service, students can connect with colleges and universities directly. In addition, they may hear from other education and career service providers offering educational opportunities such as college admissions services, financial aid, and career info, as well as extra-curricular, enrichment, and recognition programs. 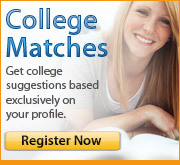 Parents can use My College Options to find answers to their college planning questions. They are provided with newsletters, articles, answers to frequently-asked questions and other resources that will inform and support their involvement in their child’s college search process. How does My College Options work? Students may complete a My College Options Questionnaire in school, under the direction of a school counselor or teacher. Completion of either the online profile or the in-school questionnaire will result in an immediate list of colleges that match the students’ individual needs and interests. These lists show which of the over 5,500 accredited post-secondary institutions across the nation offer programs that match the individual students’ needs and interests match. Access to the online student profile is available 24/7. Using their personal online profile, students can modify their college search, explore new directions, and find additional opportunities and assistance for their college planning. High schools use the service by distributing the My College Options Questionnaire to their students in a classroom or advisory setting. A report with results from in-school completion of the questionnaire is sent to the high school counselor or teacher who has submitted them. Counselors will find the service helpful as a supplement to their college and career counseling programs. Teachers will find the information gathered from the My College Options Questionnaire helpful in assessing their students’ needs in their subject areas.